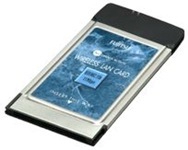 This card is 11Mbps (maximum) wireless LAN card in accordance with IEEE802.11b. Wireless LAN can be constructed only with this card. Moreover, it is possible to connect it with Internet using the Broad band and existing LAN by using wireless LAN kit (FMNS-WL1) and network station (FMNS-101) with a wireless, broadband router, wireless LAN station, the family network station, and the TA function + personal computer with built-in the home made of our company server function of another option.